Lately we’ve managed to spend a bit more time working on new recipes and flavours, and getting a bit creative. So what’s new for 2017? I have had a little look through the predicted food trends for this year to see what could inspire our next bakes. This green tea powder has become big in baking, for it’s super bright colour and health benefits. It’s not something we have included in our menu yet, but I think 2017 will be the year. 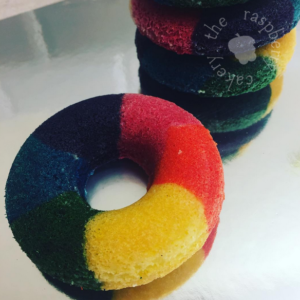 The rainbow food trend has been around for a while, and shows no signs of leaving us, especially with the recent intoduction of pastels and sparkles for a magical, Unicorn twist. From Unicorn macarons, to Unicorn toast (!!) it seems no food is safe from the rainbow. This trend is newer than the rainbow, but equally as exciting. Usually in deep, wonderful blues, purples and black, with amazing marbled effects and often some glitter. The wonder of deep space has been seen as a glaze on cakes and doughnuts, in the sponge, or piped on top of cupcakes. As I am yet to try a marble glaze, this is one trend I am super excited to try out in 2017…. glaxay glazed donuts, here I come! 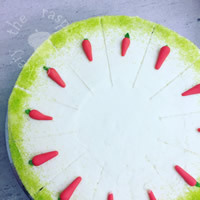 Vegetable Cakes – 1 of your 5 a day? So we’ve all heard of carrot cake, beetroot in a chocolate cake, maybe even courgette and lemon cake, but vegetables are set to be the next big ingredient in baking. From parsnips & butternut squash to kale & peas there’s a recipe for everything. Soon you’ll be able to get your 5 a day in cake form. Hooray! Not a trend, but there is a definite shift in the way people are eating, with everyone being much more mindful about what they choose. Each of these diets has been wonderfully catered for by local businesses who specialise in each area, and we cannot compete as we use a whole host of non-vegan and gluten containing products. However, we do like a challenge and will be looking at other ways to replace sugar in our bakes over the coming months. In a bid to find some naturally gluten-free ingredients to bake with, there is now a wide range of alternative flours and sugars on our shelves. Coconut flour, spelt flour, almond flour, soya flour, are all available to experiment with. Bringing different textures and flavours to cakes. A colour not often found in natural food, purple is set to be ‘the new black’ on your table this year. This rich colour apparently indicates a high level of nutrients and antioxidants. This means more blueberry muffins, blackberry cakes, even purple carrot cake. Not sure about aubergine…but you never know! Food boxes have again been around for a while, but seem to have taken off over the last year. Whether they contain a selection of snacks, a range of ingredients for you to prepare your own food, or ready made meals there appears to be something for everyone. There are even some baking boxes available on a subscription to give you a chance to try something new. Who knows, maybe you’ll be able to get The Raspberry Cakery on your doorstep in 2017. I had to include this! It makes me squirm to think about it, but apparently insects are ‘the food of the future’. So, cricket cupcakes, mealworm brownies and locust cookies could be on the menu soon. So, Swansea, what do you think? Are critter cupcakes your thing? 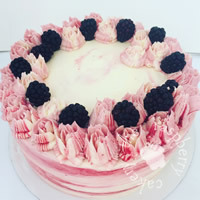 Would you try a Raspberry Cakery recipe box? How about a pea layer cake? We would love to know what you think.